This project is about writing a basic but complete Linux kernel USB driver module together with a simple, programmable USB device to test the driver and have something to play with. 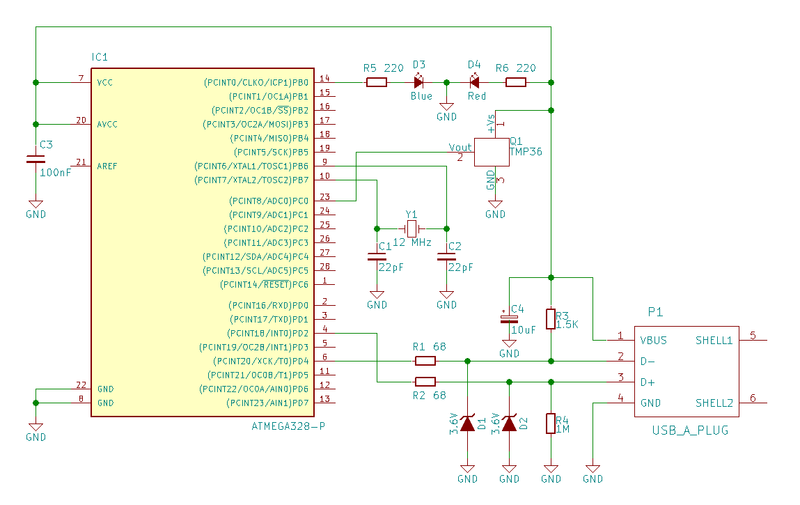 It includes a schematic and a PCB layout, and a simple Java desktop application. The intention for me was mainly to get an understanding of how a Linux driver module looks like and how it works, how a kernel module is automatically loaded when a hardware device is connected to a PC, and how a device file is created, allowing an application to communicate with the device. It is great fun! The Linux kernel is just awesome, it all works so well. Compiling your own driver module and integrating it in the kernel is incredibly easy. I however had to spend quite some time to read documentation and put together this basic USB driver looking at other drivers and examples out there, so I thought it is maybe interesting for someone if I share it here. 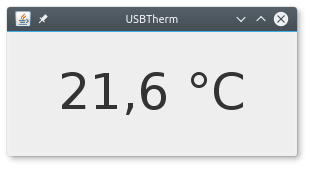 If you think a USB thermometer is just too simple, have a look at WeatherPi. The USB 1.1 thermometer is based on an 8 bit AVR microcontroller like the well-known ATmega328P and the V-USB firmware-only USB implementation. Of course, the 328P is overkill for such a simple application, a smaller one will do as well as long as V-USB runs on it. The temperature is measured with a TMP36, converted with 16x oversampling and averaged with an exponential weighted moving average, contributing to accurate and stable measurements. With the TMP36, the measuring range is -40 to +150°C with ±1 to ±2°C accuracy. An alternative, i.e. for a USB 2.0 device, would be to use one of the "U" ATmega's like the ATmega32-U2 providing USB 2.0 hardware support and LUFA, a Lightweight USB Framework for AVRs. The schematic is based on Metaboard and, as well as the PCB, created with KiCad, which is also just awesome. I just needed to figure out to use the "g" key to drag parts and wires, from then I found it very easy and intuitive to use. For routing I used FreeRouting, which is also awesome and very easy to use together with KiCad. Here is a Maven based fork of FreeRouting. I've ordered my first 3 PCBs ever from OSH Park, which is super easy, all that needs to be done is to upload the KiCad PCB project and check if everything looks fine. I can't really compare the pricing with other PCB manufacturers, I had a look at a few, but I just didn't feel like filling out a huge form to get a quote. At OSH Park it is as simple as it can be: $5 per sqare inch for 3 two-layer boards with free shipping. The PCBs were produced and delivered to Germany in 14 days and they look great! The firmware can be found here. Besides initializing V-USB and then calling usbPoll() in the main loop, at least the function usbFunctionSetup() must be implemented. I've implemented just one request CUSTOM_REQ_TEMP, which is a custom "vendor" type status request used by the kernel driver to request the current temperature value, and is returning USB_NO_MSG, so the function usbFunctionRead() is called to actually read the value. For the function to be called it is also necessary to #define USB_CFG_IMPLEMENT_FN_READ 1 in usbdrv/usbconfig.h. For an unofficial vendor id, I checked against The USB ID Repository to find one that is not in use and thus no other driver should feel responsible for. The project contains a Makefile including the targets make to build it and make flash to flash it on the controller. It is probably necessary to make some settings in there for the programmer being used. Also, lfuse of the 328P must be set to 0xf7 or 0xff so the crystal is used is clock source. The Linux driver can be found here. I enjoyed a lot to get into kernel modules with the very well written Linux Kernel Module Programming Guide, but unfortunately is a bit outdated and it doesn't cover USB driver modules. For example, there is module_usb_driver(), a helper macro for registering a USB driver, replacing module_init() and module_exit(). Now, when the device is connected, the module is loaded automatically. That's basically the whole wiring, all that's left is to implement the functions probe, device_open() and so on. The value is later written to the buffer message and can then be read by an application from the device node in device_read(). The desktop app can be found here. It really is very simple, basically just a frame with a label displaying the temperature value read from the device file once a second. The project contains a little shell script that can be used to start the app.